When is it more important to speak from your heart? Your friend is about to make a disastrous decision. You see problems in your son or daughter's marriage. At work you see a better approach than the one your supervisor suggests. Should you speak up? Or should you keep the peace by staying quiet? Using biblical and contemporary examples, this book shares important strategies for discerning God's direction, acting on His Word and building better communication within your workplace, church and home. 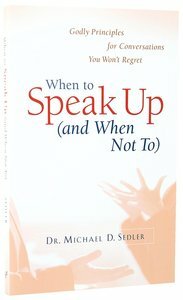 About "When to Speak Up (And When Not To)"
Updated Bio - April 2006 Michael Sedler (D.Min., Christian Life School of Theology) ministers in churches and provides consultation services to schools and businesses throughout the United States. Michael is the author of Stop the Runaway Conversation and When to Speak Up When to Shut Up and works as an adjunct professor for three universities. He and his wife, Joyce, live in Spokane, Washington.